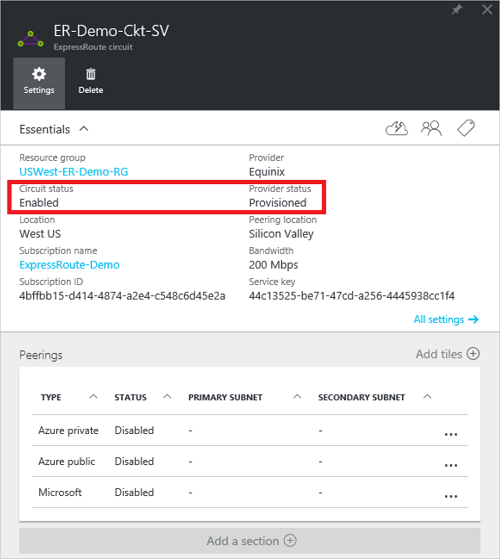 You can configure one, two, or all three peerings (Azure private, Azure public and Microsoft) for an ExpressRoute circuit. You can configure peerings in any order you choose. However, you must make sure that you complete the configuration of each peering one at a time. For more information about routing domains and peerings, see About circuits and peerings. Make sure that you have reviewed the prerequisites page, the routing requirements page, and the workflows page before you begin configuration. You must have an active ExpressRoute circuit. Follow the instructions to Create an ExpressRoute circuit and have the circuit enabled by your connectivity provider before you proceed. The ExpressRoute circuit must be in a provisioned and enabled state for you to be able to run the cmdlets in the next sections. If you plan to use a shared key/MD5 hash, be sure to use this on both sides of the tunnel and limit the number of alphanumeric characters to a maximum of 25. Special characters are not supported. These instructions only apply to circuits created with service providers offering Layer 2 connectivity services. If you are using a service provider that offers managed Layer 3 services (typically an IPVPN, like MPLS), your connectivity provider configures and manages routing for you. We currently do not advertise peerings configured by service providers through the service management portal. We are working on enabling this capability soon. Check with your service provider before configuring BGP peerings. This section helps you create, get, update, and delete the Microsoft peering configuration for an ExpressRoute circuit. Microsoft peering of ExpressRoute circuits that were configured prior to August 1, 2017 will have all service prefixes advertised through the Microsoft peering, even if route filters are not defined. Microsoft peering of ExpressRoute circuits that are configured on or after August 1, 2017 will not have any prefixes advertised until a route filter is attached to the circuit. 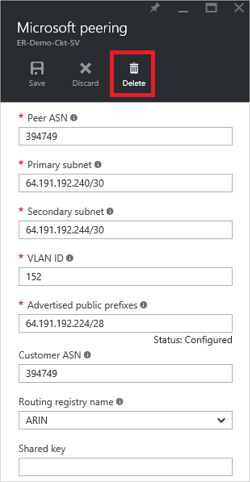 For more information, see Configure a route filter for Microsoft peering. Configure ExpressRoute circuit. Ensure that the circuit is fully provisioned by the connectivity provider before continuing further. 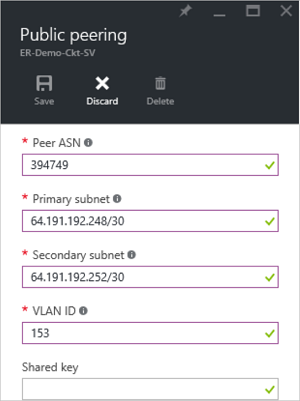 If your connectivity provider offers managed Layer 3 services, you can ask your connectivity provider to enable Microsoft peering for you. In that case, you won't need to follow instructions listed in the next sections. However, if your connectivity provider does not manage routing for you, after creating your circuit, continue your configuration using the next steps. Configure Microsoft peering for the circuit. Make sure that you have the following information before you proceed. A /30 subnet for the primary link. This must be a valid public IPv4 prefix owned by you and registered in an RIR / IRR. From this subnet you will assign the first useable IP address to your router as Microsoft uses the second useable IP for its router. A /30 subnet for the secondary link. This must be a valid public IPv4 prefix owned by you and registered in an RIR / IRR. From this subnet you will assign the first useable IP address to your router as Microsoft uses the second useable IP for its router. A valid VLAN ID to establish this peering on. Ensure that no other peering in the circuit uses the same VLAN ID. 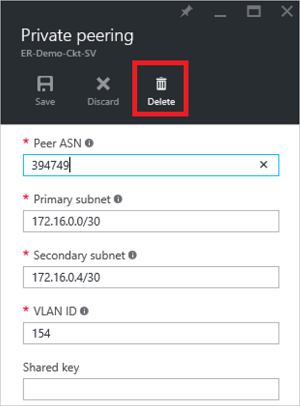 For both Primary and Secondary links you must use the same VLAN ID. Advertised prefixes: You must provide a list of all prefixes you plan to advertise over the BGP session. Only public IP address prefixes are accepted. If you plan to send a set of prefixes, you can send a comma-separated list. These prefixes must be registered to you in an RIR / IRR. 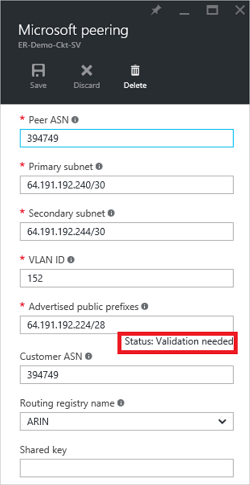 Optional - Customer ASN: If you are advertising prefixes that are not registered to the peering AS number, you can specify the AS number to which they are registered. Optional - An MD5 hash if you choose to use one. You can select the peering you wish to configure, as shown in the following example. Select the Microsoft peering row. Save the configuration once you have specified all parameters. If your circuit gets to a 'Validation needed' state (as shown in the image), you must open a support ticket to show proof of ownership of the prefixes to our support team. You can view the properties of Azure public peering by selecting the peering. You can select the row for peering and modify the peering properties. 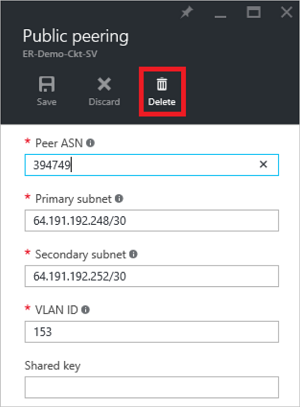 This section helps you create, get, update, and delete the Azure private peering configuration for an ExpressRoute circuit. Configure the ExpressRoute circuit. Ensure that the circuit is fully provisioned by the connectivity provider before continuing. 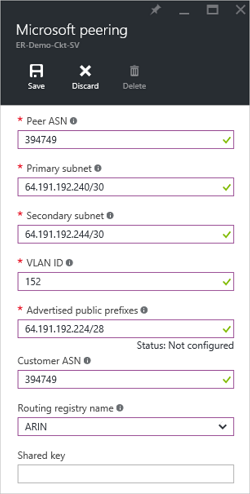 If your connectivity provider offers managed Layer 3 services, you can ask your connectivity provider to enable Azure private peering for you. In that case, you won't need to follow instructions listed in the next sections. However, if your connectivity provider does not manage routing for you, after creating your circuit, continue your configuration using the next steps. A /30 subnet for the primary link. The subnet must not be part of any address space reserved for virtual networks. From this subnet you will assign the first useable IP address to your router as Microsoft uses the second useable IP for its router. A /30 subnet for the secondary link. The subnet must not be part of any address space reserved for virtual networks. From this subnet you will assign the first useable IP address to your router as Microsoft uses the second useable IP for its router. AS number for peering. You can use both 2-byte and 4-byte AS numbers. You can use a private AS number for this peering except for the number from 65515 to 65520, inclusively. 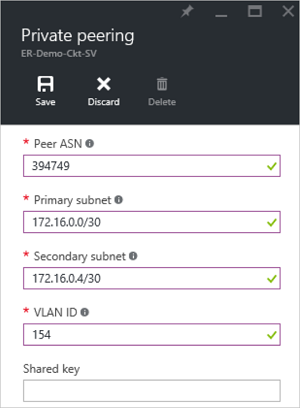 You can view the properties of Azure private peering by selecting the peering. You must ensure that all virtual networks and ExpressRoute Global Reach connections are removed before running this example. 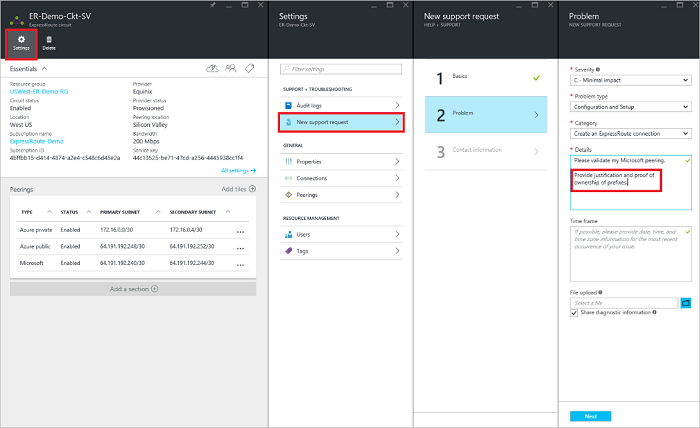 This section helps you create, get, update, and delete the Azure public peering configuration for an ExpressRoute circuit. Configure ExpressRoute circuit. Ensure that the circuit is fully provisioned by the connectivity provider before continuing further. 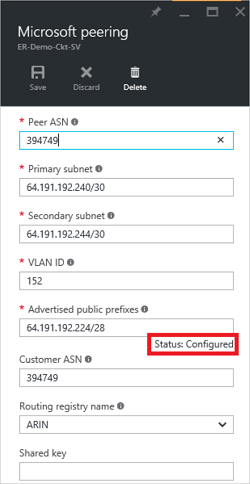 If your connectivity provider offers managed Layer 3 services, you can ask your connectivity provider to enable Azure public peering for you. In that case, you won't need to follow instructions listed in the next sections. However, if your connectivity provider does not manage routing for you, after creating your circuit, continue your configuration using the next steps. A /30 subnet for the primary link. This must be a valid public IPv4 prefix. From this subnet you will assign the first useable IP address to your router as Microsoft uses the second useable IP for its router. A /30 subnet for the secondary link. This must be a valid public IPv4 prefix. From this subnet you will assign the first useable IP address to your router as Microsoft uses the second useable IP for its router. For more information about ExpressRoute workflows, see ExpressRoute workflows. For more information about circuit peering, see ExpressRoute circuits and routing domains. For more information about working with virtual networks, see Virtual network overview.